To back me up on this, I sought out bartender Sam Ross for this week’s Manhattan-themed edition of Essential Cocktails. Ross is well known for his cocktail program at New York’s Milk & Honey, and has assembled the drinks lists locally at chef David Myers’ restaurants: the new Hinoki & the Bird in Century City, and West Hollywood’s Comme Ça. Ross is the mixologist who specializes in creating cocktail programs featuring modern twists on classics, and word on the street is that he’ll make you the best classic cocktail you’ve ever had. So naturally when he was in town from New York to train the staff at Hinoki I asked him if he could stop by Comme Ça (since Hinoki wasn’t open yet) to demonstrate how to make my favorite drink ever. And, naturally I’d have to taste it to, ahem, complete my “research.” Fortunately he agreed. According to Ross, a Manhattan is all about the vermouth. “People don’t realize that vermouth oxidizes, which means it goes bad. It is fortified, but not to the point where it’s shelf stable forever like a spirit is. So it needs to be refrigerated or kept on ice. And you need to go through it regularly.” Unfortunately his favorite vermouth—Carpano Antica—is only available in 1-liter bottles, so if you don’t go through that quickly, it can mess up your Manhattan. But he has a fix for that: “For home use if you like Antica, get a six-pack of Canada Dry club soda or whatever, drink it, pour it out, whatever you need to do, but refill the little bottles right to the top with Antica, seal it, and keep them in your fridge. And just take out one of the little bottles when you need it; that will keep it fresh for a long time. That’s a Sam Ross original right there.” This way, there isn’t much air in there to oxidize the vermouth as quickly and you won’t have to keep opening and closing the same bottle through the short life of the vermouth. 1) Add all three ingredients to a mixing glass. Recommended vermouth: Dolin Sweet (Rouge) Vermouth or Cocchi Vermouth di Torino (Rosso) work well, though Carpano Antica is Ross’ hands-down favorite. “I’d christen my first-born in Antica,” he swears. If you’d rather have someone make a Manhattan for you, stop by Cole’s downtown for its “professionals’ lunch special” where a Manhattan will only set you back $5 with the purchase of a French dip sandwich. For a Manhattan that will put hair on your chest, bartender Dino Balocchi at Littlefork in Hollywood mixes up what he calls a “Stagghattan” with George T. Stagg bourbon, Sazerac Rye, and Punt e Mes vermouth. 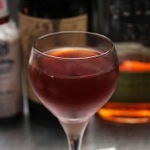 Mid-Wilshire, Paul Sanguinetti of Ray’s and Stark Bar doubles the fun with two ryes—Old Overholt and Michter’s—Carpano Antica, and Amaro Nonino (a bitter Italian liqueur). For variety, Comme Ça has a “Manhattan Variation” on its menu where you leave it to the bartender to come up with something to suit your tastes, whether you’re in the mood for a classic Manhattan, a rum Manhattan, or a Greenpoint Manhattan—a lighter, brighter version made with Evan Williams bourbon, Carpano Antica, and Yellow Chartreuse. If you’d like more of Sam Ross’ nifty cocktail tips, he has an iPhone/iPad app called Bartender’s Choice ($2.99) which is built to make you feel like you’re sitting at a menuless bar, with a bartender talking you through the drinks and telling you which ones are best suited for what you’re craving.